Well, first let me just say that these are NOT dairy free. And it's a darn shame because I LOVE these cookies. I used to see them in Stop & Shop every single time I went shopping and they beckoned to me but I never bought them. I had checked the package before and for some reason had it in my head that they were dairy free so when I WON the contest a couple months ago on Twitter I didn't think twice. As soon as they arrived I dove right into them. I ate almost half the bag before actually looking at the ingredients list again and sure enough - dairy. Ooops!!! This was totally my fault. Lesson learned. Fortunately I didn't pay for my mistake and was able to finish off the entire bag (in under two days) without issue. Oh they are so so yummy. They are a crunchy, crumbly, satisfying cookie. And no, I don't feel bad that I entered and won this contest despite the fact that there are other people out there that are not dairy intolerant that could've won instead! Sorry! ;-) These were just too good to pass up. 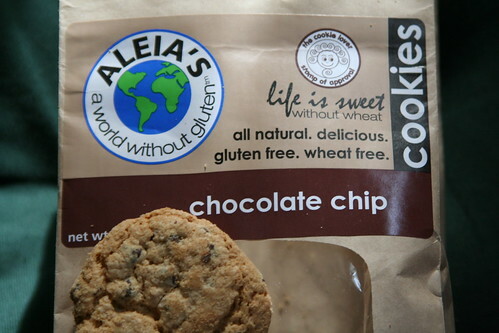 Check out Aleia's website, blog and twitter!